Fashion and hospitality entrepreneur Christina Ong has always believed food should deliver pleasure and confidence, as well as health and energy. This approach to cooking evolved out of her family home to inspire the kitchens of her award-winning COMO Hotels and Resorts worldwide. Called COMO Shambhala Cuisine after her holistic wellness brand, COMO Shambhala, the philosophy embraces all that is seasonal, pure and sustainable in delicious, nourishing combinations. 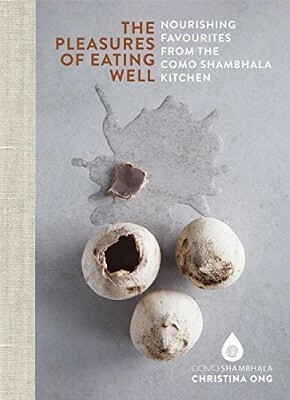 In this new book, 147 classics from the COMO Shambhala kitchens from the Turks and Caicos in the Caribbean to the mountains of Bhutan have been meticulously re-configured to introduce COMO Shambhala Cuisine to home cooks. Spanning no-cook juice combinations and raw salads to luxurious dishes suitable for entertaining, the recipes are organised in logical chapters for easy navigation. Each recipe's standout nutritional benefits are clearly highlighted and simply communicated. The reader can therefore choose menus according to personal taste and occasion, following the recipes precisely or experimenting with the different techniques and flavour combinations. The result is pure pleasure with each recipe delivering the vitality needed to juggle busy lifestyles, hectic travel schedules and the push-and-pull of family and work.